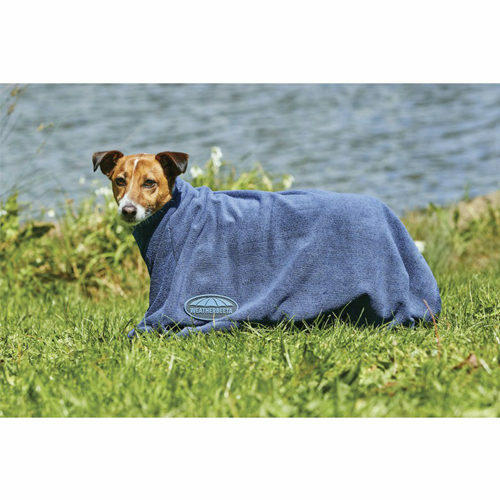 Weatherbeeta Drying Bag for Dogs is a special dog bathrobe which will ensure your dog will dry faster after swimming or washing. Because it is a drying bag. Since your dog's legs are also covered, you will not be bothered by dirty paw prints in your home or car. Weatherbeeta Drying Bag for Dogs is a special drying bag for dogs. Your dog can dry off well in this bag. The Drying Bag from Weatherbeeta ensures your dog does not leave dirty paw prints in your car or home. You can use the zip to open the bag, so you can easily place your dog in it. Your dog still has enough freedom to move about. Have you used Weatherbeeta Drying Bag for Dogs before? Let us know what you think about this product.